Firewall and network data filtering. Proxy servers allow to hide, conceal and make your network id anonymous by hiding your IP address. It fasten the service by process of retrieving content from the cache which was saved when previous request was made by the client. It helps to customize the source site for local users by excluding source content or substituting source content with original local content. In this the traffic from the global users is routed to the source website through Translation proxy. In this the destination server receives the request from the anonymzing proxy server and thus does not receive information about the end user. Since the proxy server hides the identity of the user hence it protects from spam and the hacker attacks. In this the client requests its internal network server to forward to the internet. Open Proxies helps the clients to conceal their IP address while browsing the web. 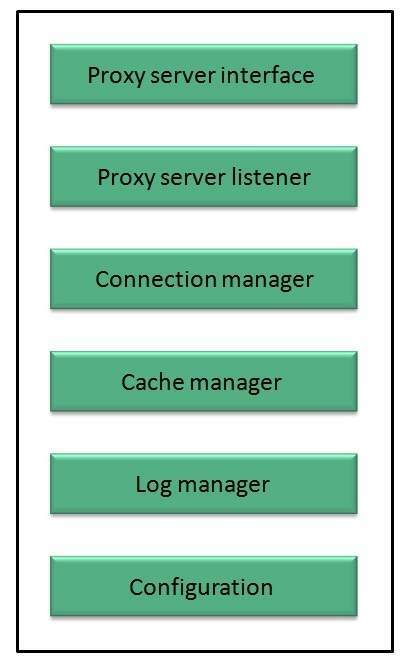 In this the requests are forwarded to one or more proxy servers and the response from the proxy server is retrieved as if it came directly from the original Server. It is the port where new request from the client browser is listened. This module also performs blocking of clients from the list given by the user. Read request from header of the client. Parse the URL and determine whether the URL is blocked or not. Generate connection to the web server. Read the reply from the web server. If no copy of page is found in the cache then download the page from web server else will check its last modified date from the reply header and accordingly will read from the cache or server from the web. Then it will also check whether caching is allowed or not and accordingly will cache the page. This module is responsible for storing, deleting, clearing and searching of web pages in the cache. This module is responsible for viewing, clearing and updating the logs. This module helps to create configuration settings which in turn let other modules to perform desired configurations such as caching.